About two-thirds (64%) of Americans offer positive evaluations of the quality of candidates who have run for Congress in their district in recent years. But younger adults were less likely than older Americans – and partisans were more likely than independents – to say this, according to a Pew Research Center survey conducted earlier this year. 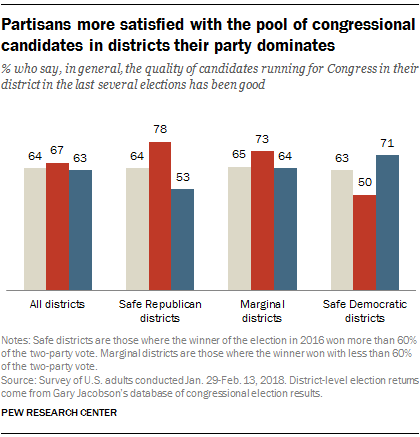 Overall, Republicans and Democrats were about equally likely to say their district’s past congressional candidate pool has been good, but there were substantial differences in these views between those who identify with the parties and those who lean toward a party. While 74% of Democrats said recent candidate pools were of high quality, just 48% of Democratic-leaning independents said the same, with a similar gap between the views of Republicans and GOP leaners. Claire Sukumar is an intern at Pew Research Center.